No, this baguette is not from the bakery! COOKING IS EMPOWERING because not knowing how to cook makes us dependent on Kraft and Lever Brothers and the other multinationals we allow to feed ourselves and our families. I remember how I felt the first time I made my own baguette. Is there anything that seems more impossible to achieve than a real French baguette? Yet all you have to do is follow the recipe, learn from the first few failures, and soon you're making all your own bread, including French baguette. I also remember the first time I tied my own roast. I was a successful restaurateur yet I depended on the butcher to tie my roasts for me. I would watch as he made a special knot that didn't require a helper to lend a finger to keep it from slipping. One day I said, "Show me how to do this," and he did, and from then on I was able to make all sorts of elegant packages for my customers. Empowering. 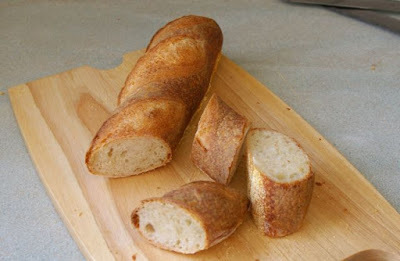 Anyway, you ought to try your hand at making your own baguette. The folks at King Arthur Flour have a real easy and fully illustrated recipe on their blog, Baking Banter.